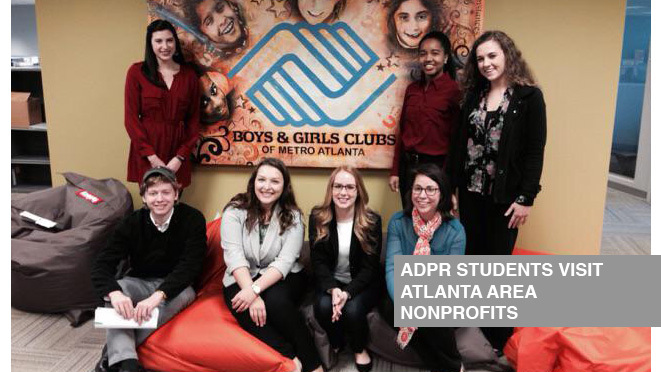 On Feb. 12 and 13, 2015, students from Grady's AdPR program visited six organizations to learn about the various types of public relations work in the nonprofit sector. Students joined Grady faculty members Kristen Smith, a senior public relations lecturer, and Ryan Carty, the director of experiential learning, on the trip to Atlanta to gain professional insights into how public relations practices can be best utilized for nonprofit organizations. The tour destinations consisted of both nonprofit organizations' internal communications departments and agencies that serve non-profit clientele, increasing students' scope of career opportunities in the nonprofit sector. At each destination, students were able to sit down with professionals to learn about the industry, ask questions and participate in case study discussions. Several of the organizations provided students with advice about how to merge their passions with their career paths. A common theme throughout the tour was a focus on storytelling — something Grady students become familiar with in their AdPR courses. The tour served to remind the visiting students that good storytelling ability can be utilized across all public relations platforms. Grady College would like to thank The Boys & Girls Club of Metro Atlanta, CARE, Advertising for Good, goodpr., HotHouse Media, Children's Healthcare of Atlanta and Arts for Learning for hosting the students over the course of the two-day event.